A Wisconsin man is credited with starting a budding trend that is bringing an old fashioned way of accessing literature to people living in an Internet world. NBC's Rehema Ellis reports. MADISON -- Three years ago Todd Bol came up with an idea to remember his mother, a teacher who had loved books and encouraged people to read. At his home in Hudson, Wisc., he built a box, made it waterproof and filled it with books. It looked like a miniature one-room schoolhouse, with a sign underneath that said “Free Book Exchange.” Bol put it on a post outside of his house and invited neighbors to take a book, and return a book. The idea has mushroomed. Bol now encourages people to visit his website for suggestions on how to build their own library. Today there are Little Free Libraries in at least 28 states and six countries including Ghana, Australia and Afghanistan. And people from more than a dozen other countries have expressed interest, Bol said. On Bol's website he offers suggestions on how to build the libraries and sells kits for a fee starting around $100. Money donated to his non-profit helps build libraries in needy communities and developing countries. The website says, "If you need help let us know. Don't let money get in the way." You can find the little libraries not just in front of homes, but also outside of health centers, coffee shops, bike paths, bus stops and store fronts. People are encouraged to send in a picture of their library so it can be posted on the website. In return they get a "Little Free Library. Take a Book, Return a Book" sign to post on what they've built, as well as a Little Free Library Charter number. "I've worked with people who will take pieces of their home or their old farm and they'll incorporate it into a library," Bol said. 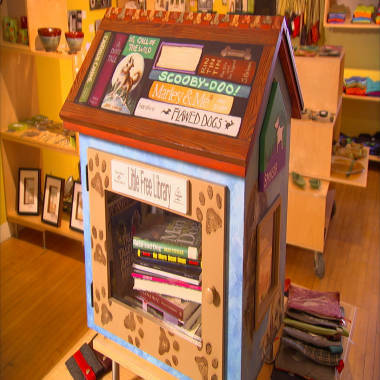 A local artist from Madison, Wisc., was commissioned to create a canine-themed Little Free Library designed to be installed near a dog park. And each one has become more than just a place for getting books and leaving books. Bol said the little libraries have fostered a greater sense of community. 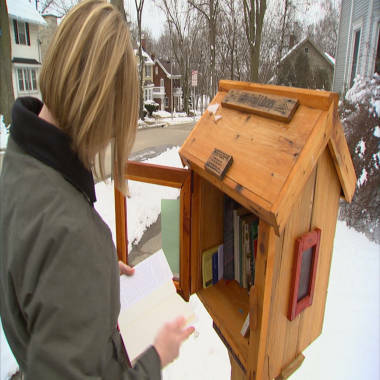 In Madison, Wisc., Meghan Blake-Horst put a little library in her front yard. "It's a continual conversation piece," she said. Amy Poland walks by this little free library on the corner of her street in Madison, Wisc., every day. Terri Connolly Cronk, who also lives in Madison, said people in the neighborhood who never stopped and talked before are stopping now because of the library that rests on the corner of her property. The library is not just encouraging readers, it's giving neighbors opportunities to get to know each other. Now one can only imagine that in this age of electronic books, Todd Bol’s mother would have loved how his story to honor her is turning out.